The Gilmore Girls cast and creator Amy Sherman Palladino are reuniting for the ATX Festival in Austin Saturday, which is amazing news — a return to Stars Hollow is something I still dream about on a daily basis, so the idea of a reunion is squeal-worthy. However, though much of the cast, including Alexis Bledel and Lauren Graham, are present for the Gilmore Girls reunion, Melissa McCarthy is noticeably absent. Where the one and only Sookie while this major event is going down? 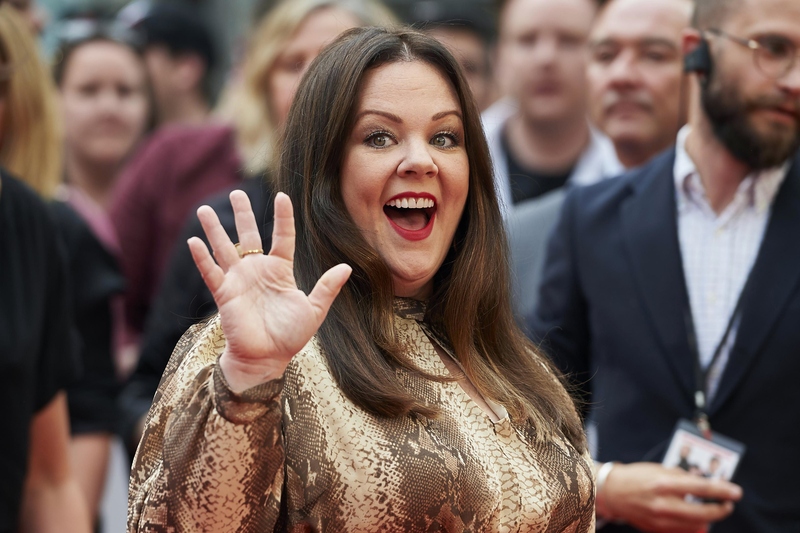 No one can blame McCarthy for her absence, of course — the actress who once played the lovable Sookie, BFF to Lorelai and chef extraordinaire, is crazy busy these days making the talk show circuit rounds thanks to the premiere of her latest movie Spy. From director Paul Feig, Spy is a James Bond-flavored comedy that sends a rookie CIA analyst (played by McCarthy) out into the field for the first time. Critics are wild about the movie — and fans are too, if Spy's current Rotten Tomato score is any indication (in other words, Spy is definitely a fresh tomato). All the fervor over Spy has McCarthy globetrotting to promote her action thriller, and you won't believe how busy she has been in the past two weeks. McCarthy totally rocked the red carpet in London for the Spy premiere. In the interview with Mail Online (posted above), McCarthy spoke highly of her Spy co-star, comedian Miranda Hart. McCarthy said she would work with Hart again "anywhere, anytime." To which I say, YES, PLEASE! McCarthy dropped by UK talk show The Graham Norton Show, and revealed the bizarre audition that landed her a role in Bridesmaids. An in-depth comedy bit about getting inappropriate with a dolphin totally sold the casting directors even though McCarthy was sure she had blown it. "You gotta get weird, you always gotta get weird!" McCarthy said, as she told Norton about how she scolded herself on the way home from the interview. Spy gives McCarthy a complex women to play, and she was thrilled to take her character on a journey from an underground CIA analyst to a field agent in her own right. It is always nice to see a McCarthy interview that lets her get serious about her amazing characters. Leave it to McCarthy to make an epic Stewart-inspired dress. Even Stewart was left speechless by her crafty prowess — and leaving that dude speechless is a feat in and of itself. McCarthy did most of her own stunts for Spy, but her worst injury happened on her way to getting a massage. Curse those marbled pool areas! McCarthy will soon have to prove she ain't afraid of no ghosts in Ghostbusters, so she swapped some spooky ghost stories on Ellen's show. Fallon remains the most adorable of all the late night hosts thanks to his wonderfully silly games. He and McCarthy played a few rounds of picture association and Fallon managed to ruin mayonnaise for McCarthy and the world at large. Want an idea of how much fun it was to be on the Spy set? Watch McCarthy tell People about how she loves "verbally destroying" Byrne (in a good way). Best press tour ever, right?